Dreaming up this invitation suite with Alex was amazing! 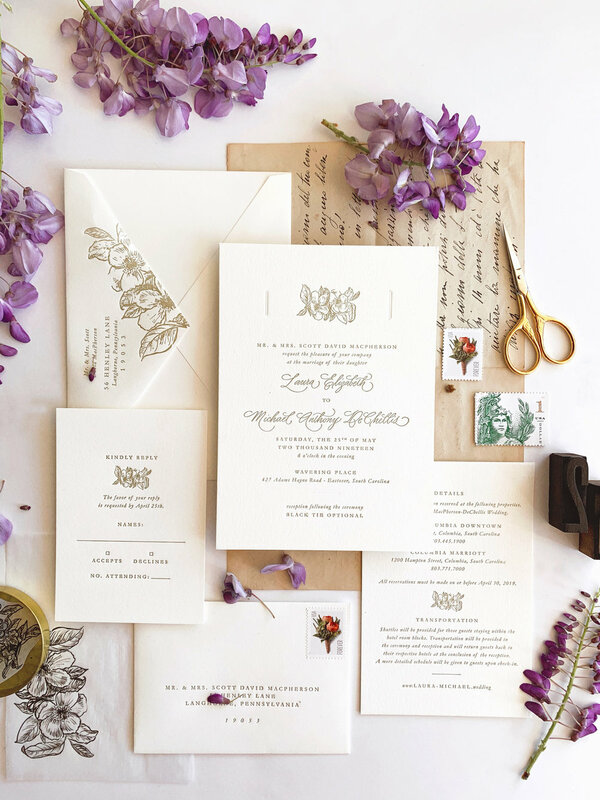 She had a vision for her stationery & I am lucky to have been the one to bring it to life! She designed her WA monogram & we added a custom illustration of olive branches to it & other parts of the suite. Olive branches was chosen because Alex is Greek & we wanted to add that in subtly. She also really wanted to include a marbled paper into the suite & make her details card different than a normal 4x6 card. I had the marbled paper digitally printed & then letterpress printed it with their website details. It was a really nice addition to the suite because you can see the marble through the vellum inner envelope! It is definitely a nice way to see the suite for the first time! The calligraphy included is by B3 Paper Co in a dusty blue to match the envelopes & ink color.